Silvio Fioravanti is a young archaeologist, who started collecting intact paper handkerchief packages some years ago: he now boasts an entire archive of card-indexed packages with about 13,600 handkerchiefs from 79 countries. This activity is very distant from his job as an archaeologist, mainly focussed on the study, archiving and search for origins. Packages are completely intact on purpose, «as they look better and deteriorate less easily», as he explained to Industria della Carta in an interview. For this reason his evaluation is only based on format and graphics. 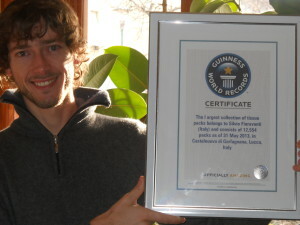 Silvio Fioravanti is a young archaeologist, who started collecting intact paper handkerchief packages some years ago. 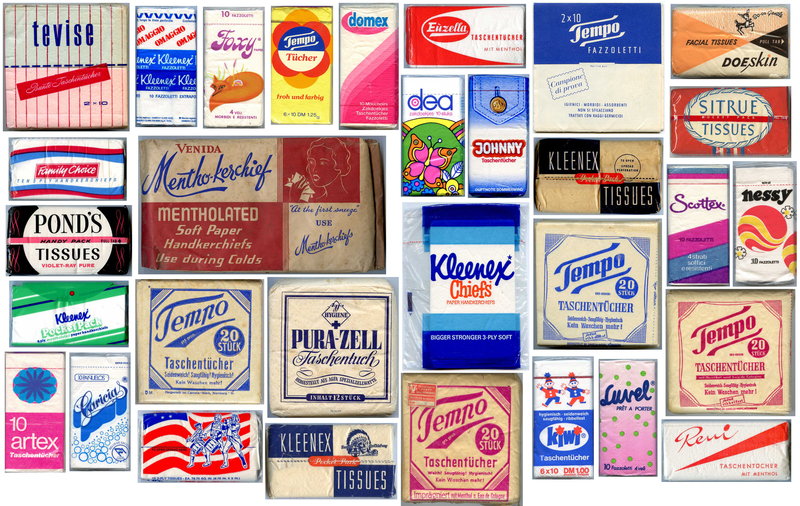 The collection, which can be seen on the Website, features all types of paper handkerchief packages: from the first 1930-1940s models to the Tempo and Kleenex handkerchiefs, up to the latest models, ranging from the most prestigious to the less renowned labels. The packages, which have all been duly scanned and archived, are filed under rarities (i.e. the historical section of the collection featuring some rare packages of period handkerchiefs are on display), cartoons (i.e. the thousands paper handkerchiefs with cartoon characters), decorated handkerchiefs (like Sniff, Ihr, Paper Design, Caspari Hankies, Hallmark,) and advertising handkerchiefs (i.e. the promotional and custom-made handkerchiefs used as gifts by hotels and companies). «Following my personal passion I have been collecting paper handkerchiefs for almost 18 years», says Silvio Fioravanti. «I have always been passionate about collecting items, yet the idea of collecting paper handkerchiefs came quite spontaneously when I was 14 or 15 years old, as I wanted to start a really original collection: paper handkerchiefs were easy to find, available in many different varieties and relatively cheap, whereby the latter is an aspect that should not be underestimated for a teenage child of that age. I keep them in boxes, as it would be impossible to keep them all on display. There are about a hundred boxes, each of them numbered and I know exactly what packages it contains». This is a demanding job, not only because handkerchiefs must all be filed, but also because all the information has to be published on the Website, which is constantly updated. A real hidden treasure – hidden for fear of deterioration of the handkerchiefs, although the most beautiful ones are kept under small display cases. 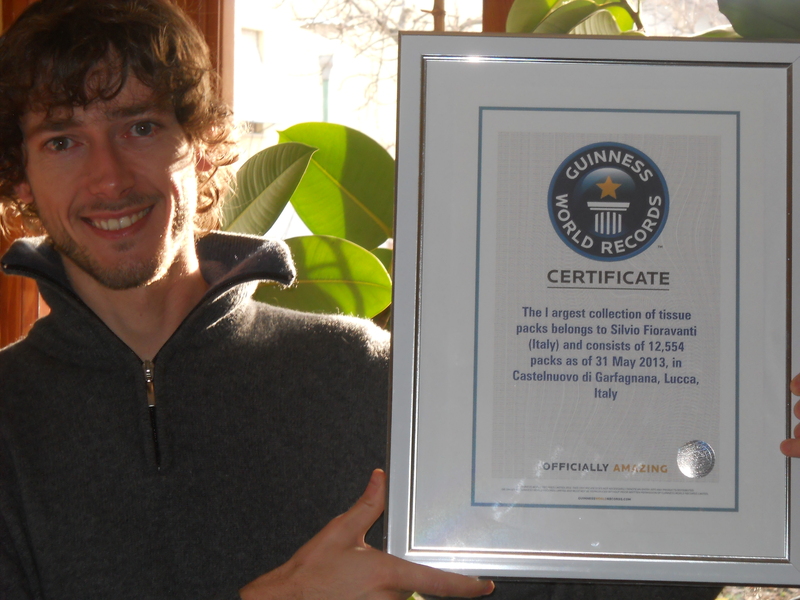 No record had yet been broken here and Silvio Fioravanti succeeded in beating the prestigious record: «I can rely on a network of other Italian and European collectors, yet no other handkerchiefs collection is as vast and varied as the one that I have managed to create over several years». Packages can be very different one from the other: with folding or flap opening, case-bound, flat, mini and wallet. And novelty for a collector is synonymous with rarity, like the rare period handkerchiefs packages or the more modern Cartoons featuring cartoon characters: «Tempo handkerchiefs, for example, came on the market in 1929, while the first pocket-size Kleenex paper handkerchiefs go back to the 1930s», says Fioravanti. «When I started this collection I would have never imagined that I could have found such old handkerchiefs; although with difficulties, instead, I found some of the first packages of hand kerchiefs ever produced. 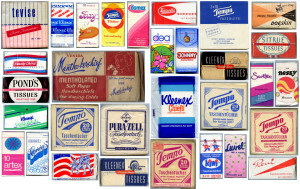 In Italy paper handkerchiefs have become popular on the market in the second half of the 1950s, and a very peculiar part of the collection consists in a promotional package of 1956 Tempo handkerchiefs instructing Italian consumers on how to use paper handkerchiefs in various moments of the day and in any period of the year. A search in Sherlock Holmes style, with the young collector always abreast and in touch with other collectors for the exchange of duplicates: «Some pieces have also come out of old drawers, but the oldest ones were obtained from online tenders on the Internet. Plus, my collection is constantly updated with modern handkerchiefs currently available on the market». Silvio Fioravanti’s collection was put on display last May 2014 in Lucca on the occasion of the exhibition «80 anni nelle nostre tasche. La storia e l’evoluzione del fazzoletto di carta» (80 years in our pockets. History and evolution of paper handkerchiefs) and during the international conference under the title «Le vie del Tissue» (The ways of Tissue). 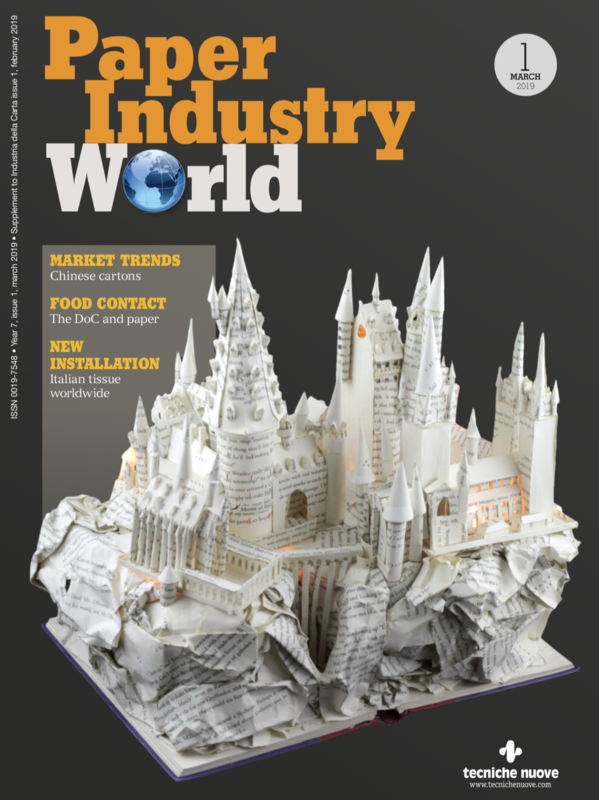 He was invited to participate in the Miami 2014 Tissue World and took part in the latest edition of the Tissue World tradeshow in Barcelona. Pictures taken from ads of Tempo paper handkerchiefs published in an Italian magazine in 1960. Previous articleSanta Giustina: structural changes to the P.M.